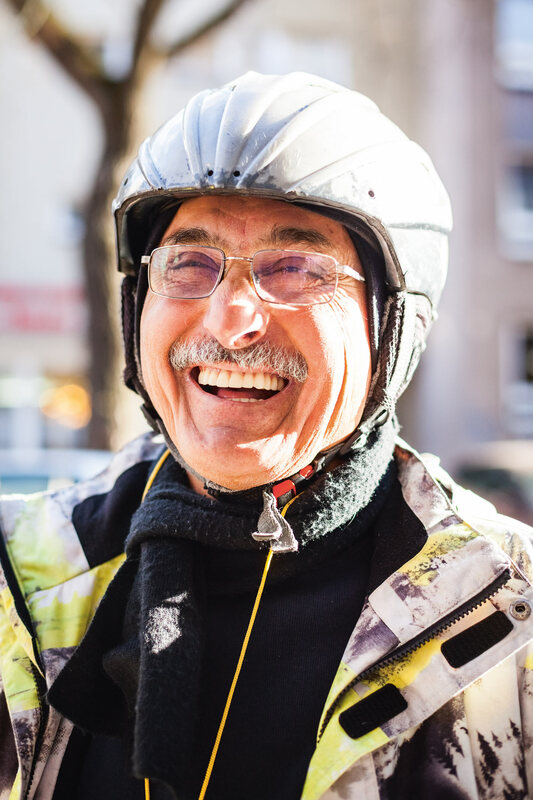 If you live in Berlin, you can’t have missed him: an old Turkish-German man cycling around every day, covered in protest slogans, blowing his whistle and blasting annoying music. But what do we actually know about that old man on the bike? NANSEN Magazine is a new print magazine from Berlin about migrants of all kinds. They get to know one migrant per issue, honing in on the personal aspects of living away from home — moments all migrants can relate to and many non-migrants will, too. The first issue of NANSEN Magazine is all about what it’s like to be a Turk in Berlin today. For Issue 01 they’ve focused on Aydin Akin, a man many Berliners will recognise, even if not by name. Aydin’s that “crazy old man on the bike”, the one who rides across Berlin every day protesting about who-really-knows-what. Turns out he offers really valuable insight about migration and the integration of newcomers. NANSEN Magazine Issue 01 launched this week. They gave us a sneak peek of their first issue, with five things you didn’t know about that old man on the bike. 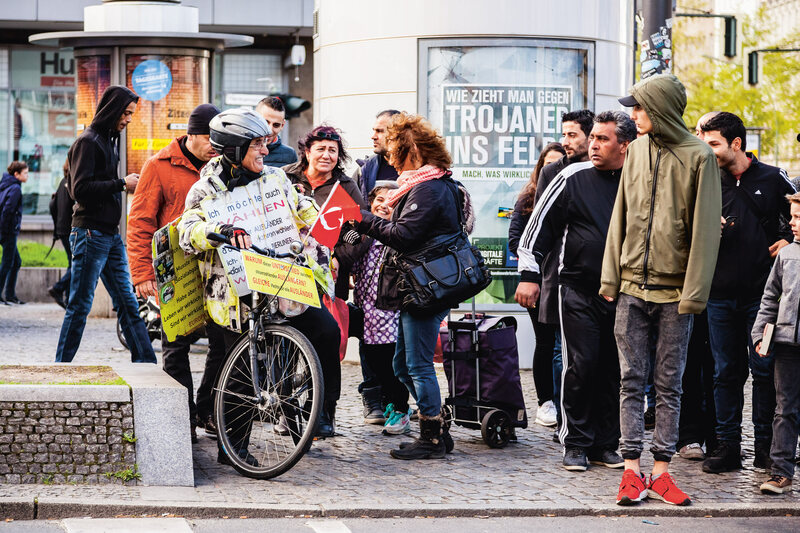 If you only arrived in Berlin recently, Aydin and his bike protest probably just seem like part of the furniture — after 12 years of watching him go by everyday, locals no longer bat an eyelid. But Aydin was new here once, too. He arrived from Turkey in his twenties, looking for somewhere to do his PhD. He’s lived in Germany for 49 years now, but he still hasn’t forgotten how hard it can be to try to settle in somewhere new, far from home. Aydin takes what is probably the world’s most inefficient bike route from his home to his office and back each day, cycling through Schöneberg, Wilmersdorf, Moabit, Mitte, Kreuzberg and Neukölln, trying to have his demonstration seen by as many people as possible. His daily ride takes three hours each way and he’s been doing it pretty much every day for 12 years. Decades before Germans flocked to train stations to welcome refugees with banners, toys and food, Aydin was busy investigating how to make the lives of Germany’s newcomers easier. Having focused on the living conditions of Turkish guest workers in Germany for his PhD in the 1960s, Aydin’s been working to improve the lives of his fellow newcomers ever since. In his work as an accountant, Aydin’s helped hundreds of new Berliners navigate the German tax system, a guaranteed headache for anyone new to Germany. And in his activism Aydin’s spent decades advocating for equal rights for all migrants. Aydin believes that giving all kinds of migrants in Germany the same rights is the best way to prevent the anger and violence that boil up when people feel excluded from the societies they live in. In his protest he demands the right to vote, to hold dual citizenship, to family reunification and to special tax deductions (all privileges currently enjoyed by migrants from some countries, but not others). Aydin’s protest began as a silent one, but when he wasn’t getting enough of a response, he added the bell. A megaphone playing his chant came next (he chants “Wahlrecht für alle” or “voting rights for everyone”), then he added a second megaphone playing the distinctive football anthem Olé, Olé, Olé. Aydin says this combination of sounds draws the perfect reaction: it makes grown-ups angry and children hyper. Despite his daily protest demanding changes to Germany’s immigration policies, Aydin doesn’t believe he is a political person. He says he’s simply doing what he feels is right. Many migrants wouldn’t call themselves political and yet, just choosing to move to another country already makes you a more political being, whether you’re ready for that or not. Lucky for us, Aydin’s facing down those immigration policies on behalf of us all. 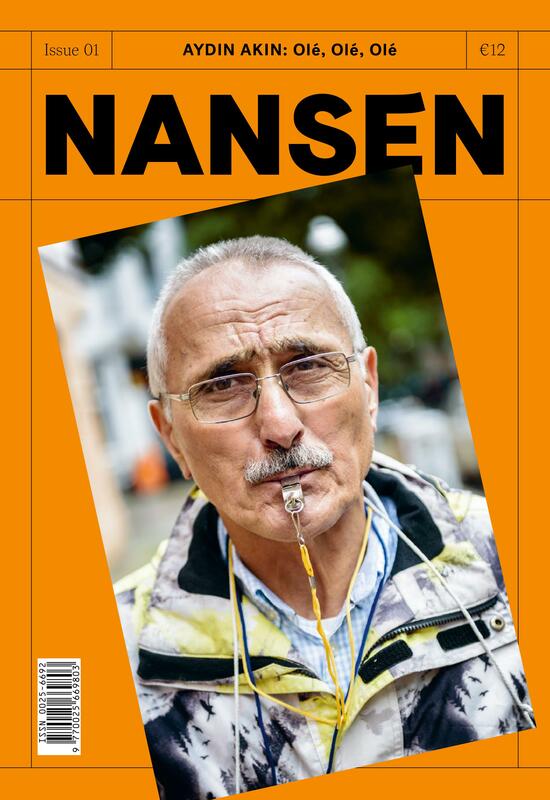 NANSEN Magazine Issue 01 featuring Aydin Akin is on sale now. Buy your copy on their website, or in selected magazine stores. GSBTB Online Magazine editor Vanessa Ellingham is also the publisher and editor of NANSEN Magazine. Photography by Olga Baczynska. Skyrocketing rents and growing homelessness in Berlin. How can you help? What does LinkedIn have to do with Give Something Back To Berlin, migrants and refugees? As it turns out, quite a lot. The second part of a series in collaboration with the Post-Conflict Research Center about what we can learn from Bosnian migration to Germany in the 1990s.